Welcome Kids To Summer With Bus Stop Ambush & A Popsicle! As Kindergarten came to a close for my daughter (tears! ), I wanted to kick off summer in a big way. The first step was a pop-up party at the bus stop. In our neighborhood, there is a tradition of greeting the kids on the last day of school with a surprise. This year I was excited to participate add a special (sweet) treat to that tradition. An email was sent out the night before school let out asking all of the moms and dads to meet at the bus stop after school armed with water squirters. Oh yes! There are nearly 30 kids who get on and off at our bus stop, so you can imagine — that’s a lot of parents armed with water squirters. The stage was set, and as the bus rounded the corner we could hear the kids screaming, “Nooooooooo!” The big kids knew what was coming and had informed the little ones. As the kids hopped down the bus steps for the last time a line of parents awaited their arrival, squirting the giggling gaggle of kids as they ran and ducked for cover. It wasn’t long before the kids took over the water squirters and (thanks to a five-gallon bucket of refill water) were squirting each other. In addition to the water fun, I turned my daughter’s lemonade stand into a Popsicle Stand. And set up shop with free Popsicles for all — with baby girl “in charge” of passing out the ice-cold treats. The whole event was over in about 30 minutes when we ran low on water refills and Popsicles, but oh the memories that were made in those first 30 minutes of summer. Down the street, another bus stop was met with silly string and another 10 bags of flour! If you are looking to kick off summer in a big way, I highly recommend a bus stop ambush (complete with Popsicles!). It could easily become tradition in your neighborhood too! 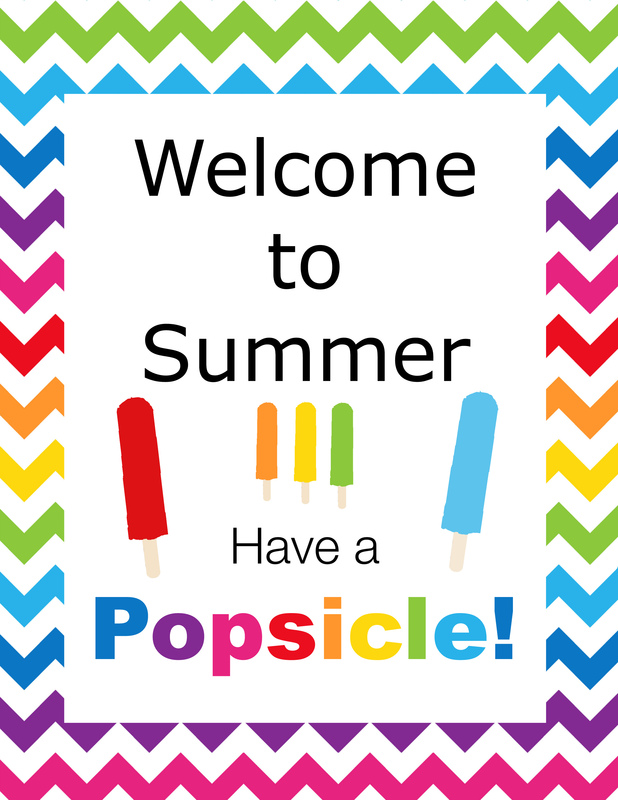 And to get you started with a pop-up Popsicle party of your own, here is a free printable Summer Popsicle sign. Download the Popsicle sign here. This post was created in conjunction with my appointment as an Ambassador in the Popsicle® Blogger Program. Visit www.Facebook.com/popsicle to join the conversation. That is just the cutest idea! What a way to bring on summer! Such a cute idea! It’s not quite warm enough for squirt guns but it’s definitely warm enough for popsicles! Summer really is all about Popsicle’s, isn’t it! I think I’ll break out a few for the kids today, it’s supposed to be a hot one. What a nice tradition. Glad you’re daughter had such a good time. Thanks for sharing! Adorable! And who doesn’t love popsicles in the summer. What a fun last day of school tradition and I love your free popsicles idea for the kids, what a nice extra treat! This sounds like a fun idea for summer! What a great idea! I bet the kids were so thrilled! What a fun idea! My niece loves playing with water squirters. I’ll have to think of something similar to this. Thanks for the idea! This is so cute and very bright ideas for my daughter’s birthday party. Thanks for sharing. Hi, What a great idea!! So fun. Your daughter is absolutely adorable in her popsicle stand. I love, love, love her hair!! I love the idea of the bus stop ambush! Your daughter’s popsicle stand is adorable! This is a great idea –so fun and creative! What a fun thing to do with the kiddos. Thank you for sharing. What a fun idea, very memorable! I lover her little popsicle stand! She will sell a lot with her charm! She is too adorable. And I love the idea of setting up a free popsicle stand. This would be a great idea for a block party of kids birthday party. This is so awesome. The girls are real cuties. As a kid, my the neighborhood kids and I would have a kool-aid stand and do this for several years to make money. I love the idea of popsicles. That is awesome! We’re hoping to upsize in the next year and my biggest request (aside from a pool) is a family friendly neighborhood like yours!